Sir William Stanhope took over this early 18th-century villa built by Alexander Pope. The palladian mansion was extended by Stanhope, who added new wings and demolished the classical portico at the front. 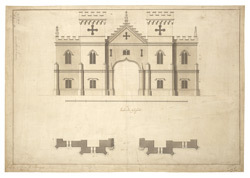 This is a design for a new gatehouse.